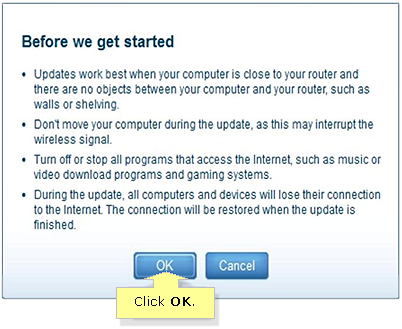 The Linksys Connect software has the capability to update the router’s software and firmware automatically. Keeping the firmware on your device updated will help it function more efficiently and fix issues you may have experienced while using it. This article will guide you on how to update Linksys Connect and your router’s firmware to its latest version. Only download the specific firmware and version for your device. For example, if your router’s hardware version is 2, only download and upgrade the firmware for a v2 router. To learn how to check your device’s hardware version, click here. If your router has a storage link and your storage device is connected to it, make sure to remove the storage device before upgrading the router’s firmware to prevent data loss. Make sure that you have created a backup configuration before removing the storage device. For instructions on how to create a backup, click here. Launch Linksys Connect on your computer. To learn how to launch Linksys Connect on different operating systems, click here. 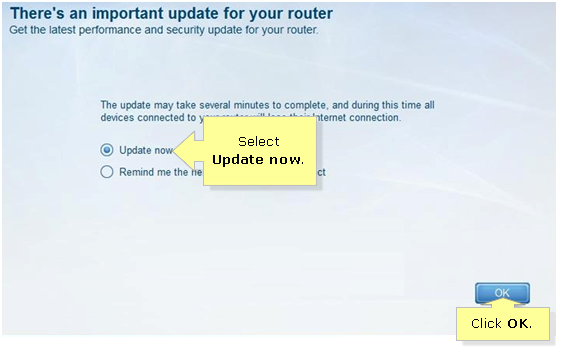 Once the prompt There’s an important update for your router appears, select Update now. Click OK to continue. NOTE: If you are not getting a prompt to update Linksys Connect, it means that the installed Linksys Connect and your router’s firmware are already up-to-date. Once the Before we get started window appears, click OK to continue. This prompt gives you guidelines on what to do while Linksys Connect is updating. IMPORTANT: Linksys Connect will prompt you when the update starts. Do not unplug the power cord of your device or reset it. The Linksys Connect software will then show you a confirmation window stating that the update has been successful. The Internet connection of your wireless computers should now be restored. NOTE: If you have upgraded your Linksys Smart Wi-Fi Router, EA2700, EA3500, EA4500, or E4200v2 to have the Linksys Smart Wi-Fi feature and decided to rollback your router to the Classic firmware, click here for instructions.